(Phys.org) —When the retina's supply of blood and oxygen runs low, physicians have to react quickly to preserve a patient's eyesight. But up until now there have been no methods sensitive enough to measure how well the eye is oxygenated. A microrobot invented by ETH researchers may come to the rescue. Kirby Pucket and the Minnesota Twins won two "World Series". One morning in 1996 Pucket awoke without sight in his left eye; he was diagnosed with a retinal vein occlusion from glaucoma. His career in baseball was over. Glaucoma is only one of several diseases that can decrease the oxygen supply to the retina: Like every tissue of our body the retina needs oxygen. An insufficient supply can cause blindness, sometimes – as in the case of Kirby Pucket – within mere hours. In order to make a fast and correct diagnosis, physicians need to be able to assess oxygen levels within the eye. However, the currently available tools are not very sensitive. Researchers of the multi-scale robotics lab at ETH Zurich have now developed a microrobot that can measure the retina's oxygen supply. "I picture it like the robots that we use these days to chart the ocean floor", comments Bradley Nelson, ETH-professor and head of the Institute for Robotics and Intelligent Systems. "With our microrobot we can chart the oxygen levels of the inner eye liquid – the vitreous - along the retina." As the retina is hard to access, ophthalmologists require the most precise tools to keep any manipulation as little invasive as possible. Nelson's team build and constantly improve miniature robots that could deliver drugs to a specific area of the retina or function as micro-scalpels to remove scar tissue within the eye. In talking to ophthalmologists and surgeons the scientists realized the potential their microrobot had as a diagnostic tool if only they could make it measure oxygen at the retina. A mere millimeter in length and one third of a millimeter in diameter, the robot can move through the vitreous, guided by magnetic fields that allow the researchers to precisely steer it into position. "We had this robot and wondered how we could use it to measure oxygen", remembers Nelson. "We could have equipped it with a computer, a sensor and a transmitter, but simple is always better." Help came from chemists of the University of Granada who had developed a fluorescent dye that behaved characteristically depending on the amount of oxygen present in its surroundings. Excited with a light pulse of a certain wavelength, the dye emits fluorescence that fades gradually. The more oxygen is present, the faster it fades. 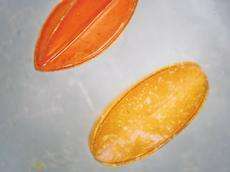 Using nanospheres made of this dye, Olgac Ergeneman of the Multiscale-Robotics-Lab and his colleagues coated the microrobot to convert it into an oxygen indicator. The nanospheres helped increase the surface and thus the fluorescence signal of the miniature device. The researchers tested the robot in water in which they generated an oxygen gradient. Thus, they could confirm whether the device measured the correct oxygen concentration at several positions of the gradient. The sensitivity they achieved – in the range of parts per million – proved sufficient for diagnostic use within the eye. Ophthalmologists could inject the micro-device with a syringe, steer it into the correct position using magnetic fields and microscopically measure the fluorescence through the pupil. As the robot is magnetically attracted to the syringe, physicians can easily remove it the same way they introduced it. The disadvantage of the method is that it is – though minimally - invasive and thus entails a remaining risk of infection. Other tools newly on the market are non-invasive but so far are less sensitive in measuring oxygen. A combination of technologies might turn the microrobot into a dual diagnostic- and operation-device.